Every Wednesday and Thursday, there is a man who is stimulating the female’s hearts. This hero is Kim Soo Hyun of The Moon that Embraces the Sun, but actually this phenomenon is not unusual. In fact, since last year there was already someone who has been shaking the hearts of many women. 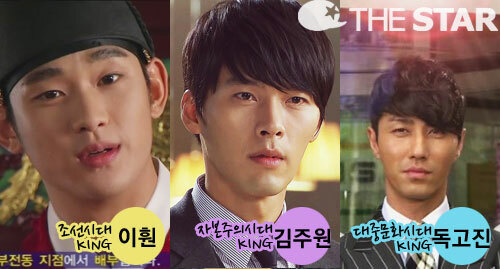 The Hyun Bin of Secret Garden during the winter of 2010, and Cha Seung-won of The Greatest Love during the summer of 2011 are as such. Why these people can move the female’s heart? This is foul! Lee Hwon who has only thinking of Yeon Woo (played by Han Ga In), can secretly goes out of palace without hesitation just to see her, but when he is in meeting with ministers, he turns into a king who loves the citizens. When there is fault with minister, he will relentlessly point out. He who does so in order to protect the people, of course, won the love of the people. How about Kim Joo Woon who lives “capitalism” world? He follows behind Gil Ra Im everyday, but in the meeting of the department stores, he can proposes eye-catching creative idea, deservingly the person who is eligible to say to the staffs “This is the best?” As for Dokko Jin, he almost has no working scenes. Probably only to the extent where he accepts the kiss of Gu Ae-jung in the CF production studio. Even so, the drama often can be seen the commodity with the face of Dokko Jin, and he also won the “best actor award” in a film festival during the initial shooting of “The Greatest Love,” proving that he is a perfect man in his work. These three men is this kind of man! Lee Hwon has a dialog line that is clutching the heart of women, “Try as you wish if you dare to leave me, this is imperial decree.” The line lets Kim Soo Hyun to firmly grasp the hearts of all women. Actually, the person who would not get closer to shaman Wol is obviously Lee Hwon, but Lee Hwon is using the royal command to say, “You’re not allowed to leave me,” how couldn’t it moved people? As for Kim Joo Won, he said to Gil Ra Im in first half of “Secret Garden,” “You will not be Cinderella, but will be Mermaid.” Not long after, Kim Joo Won said to Gil Ra Im who does not want to disappear like a bubble as Mermaid in the end, “Then let me be the Mermaid.” Dokko Jin whose heartbeat rate always maintained at safety range of 60-90, regards this as more important than anything else. After he gets to know the fact that his heartbeats increased because of the song “Piy-a-Pat” by Kukbo Sonyeo group that Gu Ae Jung belongs to, although he coldly tells Gu Ae Jung that his heartbeats will not beat faster in future, but in the end he chose to confess for the love that makes his heartbeats increased. Noe-Confucianism is prevalent during Joseon era. So always must feel cautious and conscientious towards one status class. But the king at the highest level of “Confucianism”, Lee Hwon is falling in love with Wol, the female shaman who replaced him to eliminate his adversity. The pure love where he even goes to Great Empress Dowager Yoon, abandons self-esteem to beg mercy for the life of Wol, and sobs and shouts Yeon Woo three times after knowing the real identity of Wol, have made women who are watching Kim Soo Hyung to whimper along. In the “capitalist” society, Gil Ra Im is in the position where she does not even dare to look at Kim Joo Won. The status of Gil Ra Im who rents a small suite with friends is poles apart from Kim Joo Won. But for this woman, Kim Joo Won can sacrifice his life without regret to confess his love. While the differences in status of Dokko Jin and Gu Ae Jung can be even more realistically felt comparing with other situation. National star Dokko Jin who is loved no matter what he does, willing to devote his heart to Ku Ae Jung who is not loved for whatever she does. In the drama, in order to cover all the negative news of Gu Ae Jung, Dokko Jin is willing to pay a high price. Because of these people, there are many ladies who are indulged in the drama series for last 2 years tempted by them. But they who are guilty of foul are also making others at a loss on what to do. Heroes that stop at nothing to commit foul will continue to make audience cries for them, and even clutches own thigh for tempting by them.